Do you have any pictures of the LRT operating in this time that you would like to share with us? Can you share any memories of it with us? Please contact us, all publishable entries considered! The "D" end of the train clearly showing the "Elephant & Castle" destination. One of the many school fetes; this was at Surbiton with a friend of the club at the controls. The model alongside a prototype set at one of the LU depot open days. The train alongside the decorated trailer used for getting it about! "Woking 150," and two "Mr.-Men" took a ride on the tube! "Woking 150" again, and one of the very few events where the centre car was used, thus a three-car set! Another LU Depot open day, one newer train decorated as "Ned" from a one-off story (and the model became "Ted" for some time afterwards - one of the characters from the story)! The 38 stock as 'Ted'. The "Tube" on shed at the Pinewood Miniature Railway alongside a "Black-5," Pannier Tank and a Bagnall 0-4-0ST loco. One of the few static display events, this one at Bracknell, and the "Ginny" is also seen. Another school fete and many more delighted passengers. This picture is from the early nineties, but there are many who remember the train from then, with fondness. A special cake was baked (and certificate produced) for the 20,000th passenger. 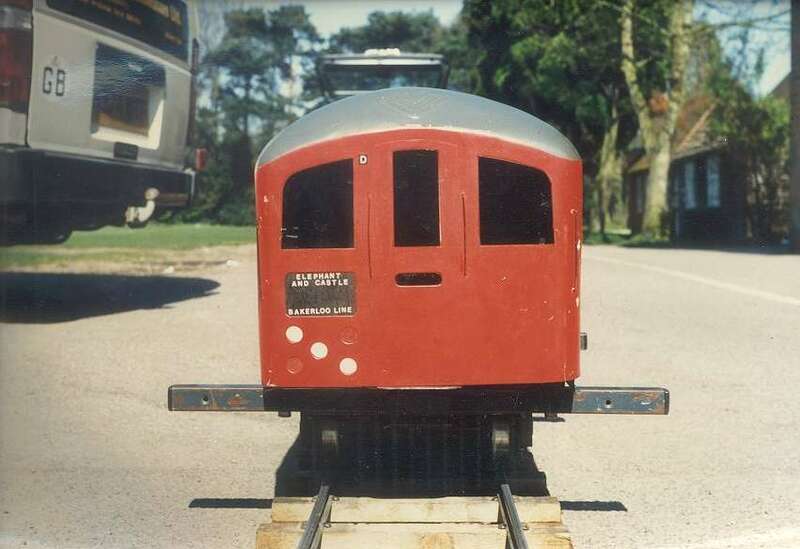 In this view, the LRT's track is seen in use by the Yateley & District Miniature Railway Society; but before the LRT itself had been completed. Nearest the camera is a "Shay" with riding truck; next is a Kerr-Stuart 0-4-0 loco, and then the Bagnall 0-4-0 loco. These latter two models gave the track a good pounding, and the Society did agree (eventually) to making a donation to Fred Blois to go towards the maintenance and repair costs. Adrian driving the power car of the '38 Stock on its first run after 7 years in storage, on 10th July 2003. Daniel at the controls later the same day. The two car 38 stock at an Alton Model Railway Group modelling day. Daniel driving the train, with an AMRG member as passenger. A worms-eye view of the 38 Stock on the permanent track at Acton Depot. The train is seen emerging from Greywood Tunnel while on test on the Great Cockcrow Railway. Adrian drives the LRT under the signal gantry at Hardwick Central on the Great Cockcrow Railway. The LRT and a train load of happy passengers at the Ottershaw May Fair. This was the first time the portable track had been used for a public event since being purchased from Fred Blois. Daniel drives the LRT, with a train load of passengers, at the February Acton Depot open weekend. Daniel driving the 38 stock with a trainload of passengers at the 1st Hook Scouts Summer Fayre in June 2005. Steven ("Stese") Davison driving the LRT at Ottershaw, 2006; an event so successful that we ran out of tickets! Adrian driving at the AMR with Daniel as guard. Daniel driving, the LRT is seen on the climb to Piggery Summit at the GCR, with the 'A' end car leading. Martin with a trainload of passengers at the 2006 Hook Scout Group Summer Fayre. The first passenger on the AMR ... and on the LRT (under current ownership) in February 2005. Lots of happy smiley faces ... that's the real reason we do this...! Ashford Scouts Summer Fayre 2005, Adrian driving. Daniel driving a trainload of young passengers during a publicity photo-shoot. Stephen Trower about to take a train out from Hardwick Central on the Great Cockcrow Railway. Firefighters from The Fun Service riding the LRT at Christ Church School. The LRT and 'U' class 'River Itchen' at the 2007 Ottershaw May Fayre. The LRT at Slip End Lower School. Matt Scrutton driving the 3-car LRT on the Acton Miniature Railway.